Get a taste of German culture, not to mention German beer with the sixth annual Oktoberfest which returns to Galt Gardens, Sept. 29-30. 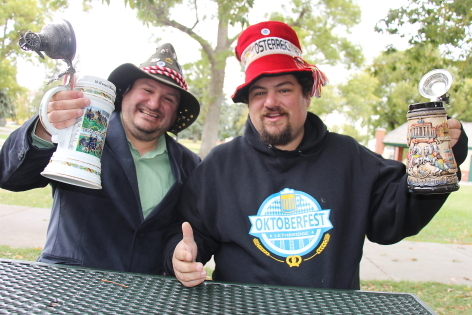 “Oktoberfest is celebrated all over the world, like St. Patrick’s Day,” said Roy Pogorzelski, who is organizing the event with his brother John. “ This year there are twice as many Pogo Brothers, we’re both MCing this year,” added John Pogorzelski, noting he has usually taken care of the logistical side of organizing this massive event while his brother has handled organizing the entertainment. 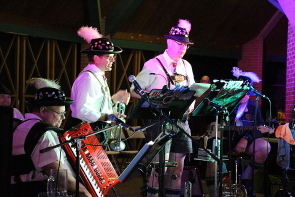 In addition to special German style beer brewed by local brewery Theoretical Brewing, there will be live German music from Alpen Schatz, who have performed every year since the event began, but also new band the Polkaholics who are performing for the first year as well as Note-Able. The event has been very popular since it’s beginning. “Last year we had 4 or 5,000 people filtering in and out of here last year. They drank us out of beer last time, but that’s not going to happen this year, we bought a lot more beer this year,” Roy Pogorzelski said. “This year we‘re hoping for 6 or 8,000 people. We’re hopeful mother Bavaria looks favourably upon us and gives us good weather,” he said. “We started in Festival square, but moved it to Galt Gardens so more people could come,” Roy Pogorzelski said, adding improvements this year include ATMs and more bathroom access on site this year as well. “We also have a family area this year, because we had people asking for one, so there will be face painting and games until a reasonable hour like 8 p.m.,” he continued. 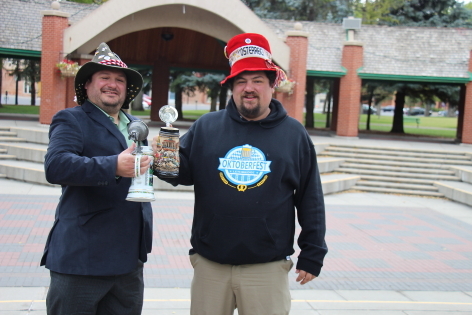 Oktoberfest runs from 11 a.m.-11 p.m. on Sept. 29 and 30. “We couldn’t do this without our generous sponsors,” he said. “It’s going to be really exciting,” Pogorzelski said. “If you can’t go to Munich, then maybe you can go to Oktoberfest here,” he continued. The seventh annual Arts Days festival, which is part of the 14th annual Art Walk, which pairs local artists with local businesses, in which they will be creating art on the spot in several cases. “We’ll have 75 artists in 40 different venues around downtown,” said Allied Arts Council project co-ordinator Muffy McKay. “We‘re planning a lot of different events with a lot of events that were already happening this week,“ McKay continued. “And Plum is having a food art demonstration called Eat Your Sins, which is a seven course meal based on the seven deadly sins on, Sept. 28, ” McKay said. There is a special Drink and Draw on Tuesday, Sept. 26 at the Owl Acoustic lounge and a special merpeople themed cabaret at the Drunken Sailor, Sept. 29 at 7 p.m.
Casa will be hopping throughout the week with numerous activities taking place in the ATB Community room. Calgary Theatre Group Tape and Paper Productions, featuring ArtsDays Young Artist Camille Pavlenko, perform “adult puppet show” “ Timmy, Tommy and the Haunted Hotel about sisters Timmy and Tommy who get trapped in the haunted Barrington Hotel where they must work with ghosts to escape alive. Tickets are $20 regular, $15 students, seniors and artists. The show begins at 8 p.m., Sept. 28 and 29. There is also a 2 p.m. matinee on Sept. 29. The outdoor artisans market is sure to be a popular draw. It will be in Rotary Square outside of Casa, Sept. 30 from 10 a.m.- 5 p.m.and Oct. 1, from noon -4 p.m. featuring works by numerous local artisans. Over at the University of Lethbridge, The first theatre Xtra production of the season opens during Arts Days in the David Spinks Theatre, on Thursday, Sept. 28 as U of LMFA candidate Lindzi Spackman directs Hannah Moscovitch’s play “Little One. ”The play, about two adopted sisters dives into a revealing dimension, runs Sept. 28-30. Casa also hosts “Muffins, Mimosas and Movies” on Sunday, Sept. 24 from 10 a.m. to 12:30 p.m. featuring art documentary “Kehinde Wiley: An Economy of Grace.” Casa hosts an artist talk with artist in Residence Tracey-May Chambers on Wednesday, Sept 27 at 7 p.m. and ends this year’s ArtsDays with the Selfie Time Capsule Project on Oct. 1. “ Last year the creativity prompts lead to a collaboration between two artists who connected through Facebook because of it,” McKay observed. 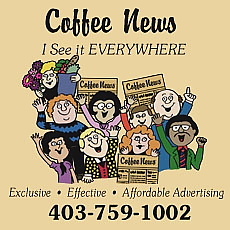 “The Lethbridge Centennial Quilters Guild has a show (at The Galt Museum , Sept. 29 and 30 from 10 a.m.-5 p.m. and Sunday, Oct. 1 from 1-5 p.m.) and local poet Ken Sears will be poetry bombing people, which is really cool. So we’ll see what happens,” McKay said. “It will be really cool. I hope people will come out and see it because it is a real showcase for southern Alberta artists. There will be visual arts, theatre, music , poetry and everything,” she said.